I was actually quite surprised to be invited to the great series Vintage May - hosted by the two lovely ladies Jess from Craftiness is not Optional and Kristin from Skirt as Top. I consider myself having a fairly modern/contemporary style but I certainly do have some vintage elements mixed into my style and I will forever be a shirring and puff sleeve lover, ha. And being surprised by the invite did not mean that I even for a second considered turning it down. No, I was certainly honored to be in such good company! Have you checked the posts so far?! Holy smokes....amazing! The decision to make this dress was sort of a no brainer. 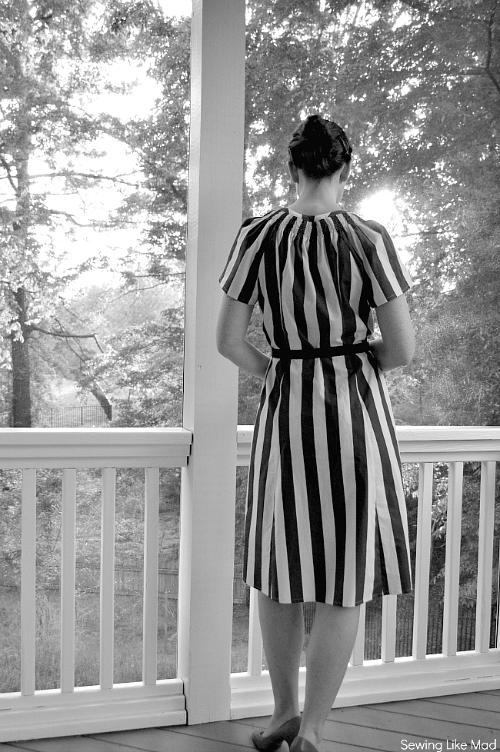 I mean duh, the pattern is self-drafted but inspired by a vintage dress (photo below). I made the pattern for my spring/summer 2007-collection when I had my women's line in Denmark and it has since been one of my favorite designs (with some help from the vintage dress - thanks vintage dress for being made with 100% polyester so I felt the need to make a new one, ha). Here is a close up of the neckline. I think this is what you call smock - because it is not made with elastic bobbin thread. My version is shirring and the elastic is pulling the neckline apart - which actually ended up with a design that I like better than the original. It makes it a bit more feminine. When I start drafting a pattern the design usually takes a few twists and turns before I am finished which for me is all part of the fun. Sometimes things change because of technical difficulties/challenges , other times because of new ideas along the way. I actually changed a detail for this version. I normal have a Mandarin type of collar like the original but decided to draft a narrow fitted band instead, so it looks like the bias tape from the front goes all the way around. I really like that new little addition. Here is a closer look of the neckline and front. I am absolutely obsessed with this French blue/cream stripe cotton from Fabric Mart. I would probably not have thought of making this dress in this fabric without the Vintage May invitation and I am sooooo happy I did. This is not the first time I blog about this pattern but it is the first time I am showing a woman's version that I have sewn. I have made several kids' versions HERE, HERE, HERE and HERE. Both as a shirt dress and shirt. 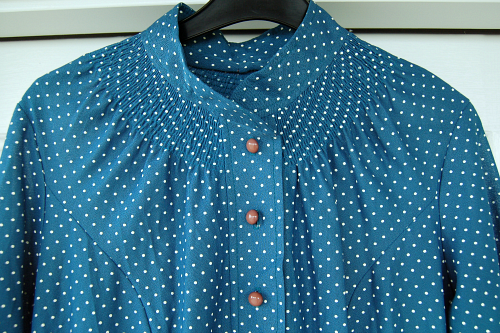 I do also have a woman's version of a shirt but have never showed it on this blog....yet. Sorry for the above photo but I could not help myself. My husband walked by when I was editing the photo, did sort of a quick stop and asked "is that you???" I did not ask him if that was meant in a good or bad way, no reason the destroy the illusion, right! 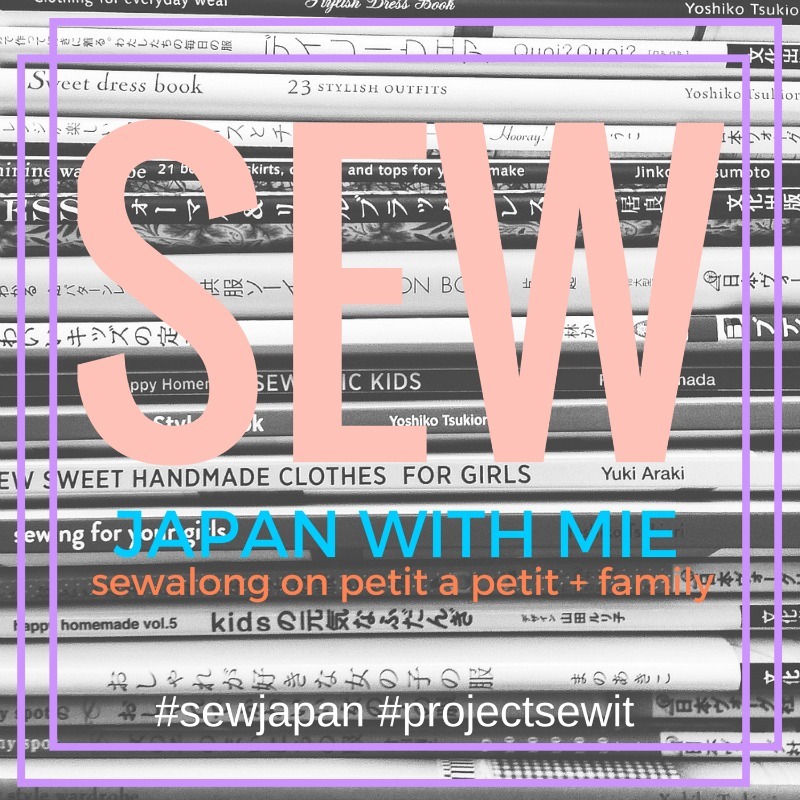 Don't forget to hop over to my good friend Celina's blog Petit a Petit and Family. 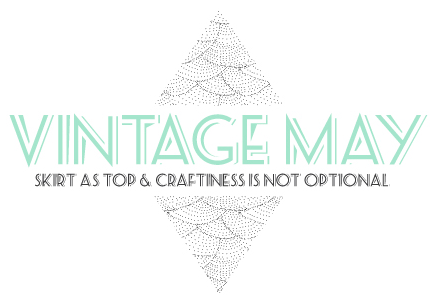 She is also posting for Vintage May today and you do not want to miss it! Thank you again Jess and Kristin for inviting me! You look so amazing. The dress is stunning. Love the pattern and the blue white stripes are perfect for it! Really great work! Wow, such a great dress and perfect styling. Looks amazing on you! Oh my gosh, my new favourite thing! Wonderful! You look amazing!!! The combo of the striped fabric and your pattern are perfect!! I'm so jealous of your drafting ability. Great lips too! Oh la la , Mie, this is a stunning dress! Absolutely gorgeous, and you wear it so well! gorgeous! lovely! stunning! amazing! perfect as always :) now I think the world needs this pattern and for the whole family too. What a beautiful dress.. sure wish there was a pattern available for it.. You did a wonderful job,drafting it from the other dress. Looks so pretty on you.. Happy vintage sewing. You look fabulous, Mie!!! I'm in awe of your drafting skills. Whoa girl! You look beautiful! That dress is so flattering. What a beautiful shape for you, love it! and those stripes are gorgeous. You look fantastic!!! What a gorgeous dress, I love the neckline, both in kids and adult versions! That dress is spectacular, and you look amazing in ti! that dress is utterly fabulous - you're a knock-out! Soooo beautiful! Just really pretty! 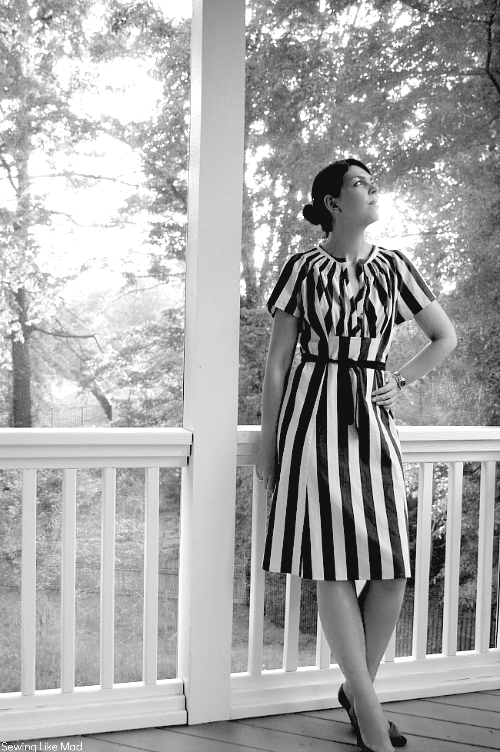 The stripes are great and I love the shirred detail. Gorgeous Mie!! I love it!! I love the stripes and details! Such a flattering dress! stunning! I'm using blue/white striped fabric on my next sewing project! You are looking gorgeous Mie! 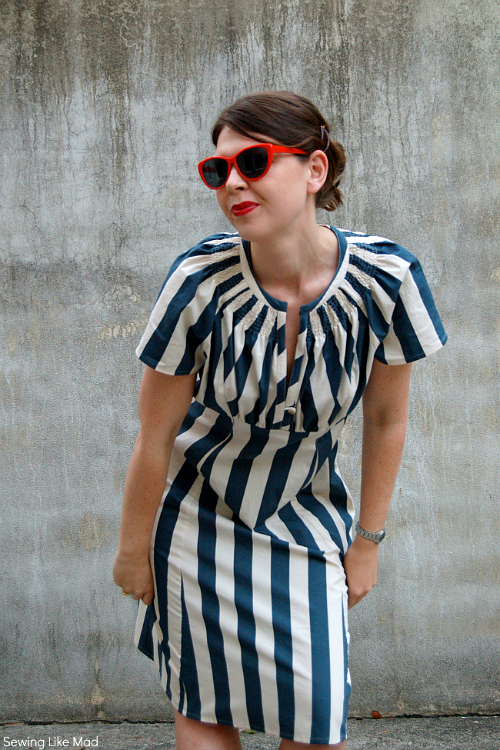 I love the dress - the stripes, the neckline - its perfect. 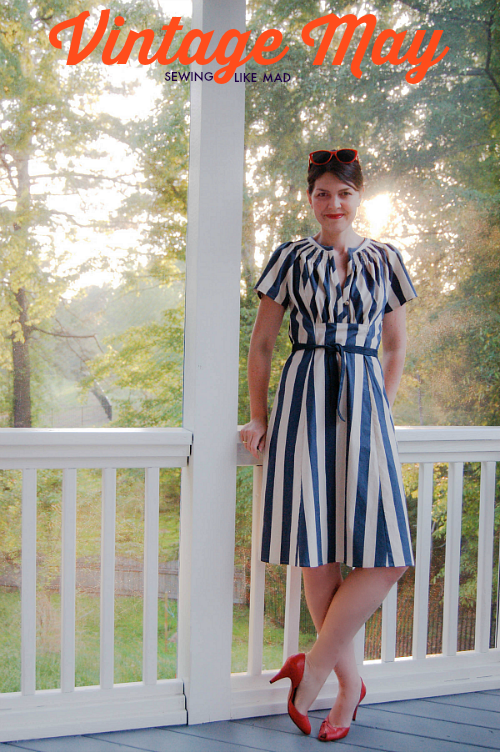 I loved the stripes on this dress and then saw the close up of the front and fell in love! So unique and beautiful! 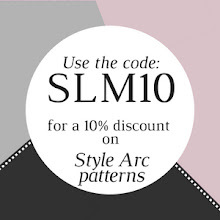 Oh, I wish you were selling this as a pattern! You look beautiful... love it! You are fantastically gorgeous. That first picture looks like a magazine cover! This is a fabulous dress from the pattern to the fabric. You look amazing in it! You certainly are the shirring queen. I've just seen the kids versions and they are equally as stunning. Your dress is just beautiful. Absolutely phenomenal, Mie! I love, love, love this dress. And you are stunning! Oh wow! This is so fantastic! And you look amazing in it!! This is fantabulous! Beautiful dress and beautiful you Mie! I absolutely love this dress. You must draw up a pattern. The front with the tucks and and smocking along with the binding around the neck just puts it over the top gorgeous. You husband's words were a compliment I am sure! You look simply stunning! Love the way you changed the front of the dress. Gah! Girl you are stunningly gorgeous. And this dress is amazing! 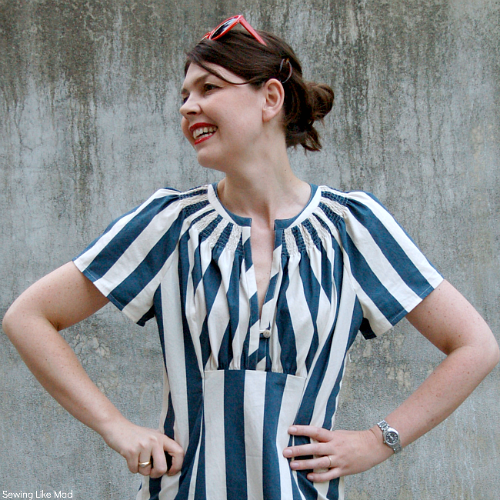 The navy and white stripes along with the shirring scream vintage appeal! Way to go! Mie, det her er den smukkeste kjole jeg længe har set!!! Du ser fortryllende ud! Det mønster der...det ku' du godt lige sælge, ku' du!! Jeg kan slet ikke stoppe med at kigge på dig - perfektion!! I really can't get over how amazing this dress is and how fantastic it looks on you! The blue stripe is perfect! Love, love, love! I want one! And you do totally look like a model! Mie - I haven't had a chance to comment yet, but you look incredible!! Total vintage Pin-Up!!!! Seriously straight out of a magazine. I love that dress and every single picture is perfection. I so wish this was a real pattern because I want one sooooo bad. this is STUNNING Mie!!! Wow, just wow. I agree with the others -- a tutorial would be very much appreciated! Please make a pattern for this dress!!!! I love everything about this so very much! You and the dress are so beautiful! Fantastic dress! Would love to make one.